The tables below provide an estimated number of Kilojoules, Calories, Total Fats & Saturated Fats per 100g (3.5 oz) of a range of foods with names beginning with E.
To find the nutritional information relating to a specific food of interest, simply scroll down the page until you find the food you are interested in. If the food you are looking for is outside the alphabetical range presented on this page, simply click on one of the Energy, Total Fats & Saturated Fats links at the bottom of this page to take you to another page containing the nutritional information you require. For important information reqarding the Accuracy and Copyright of the data contained in this table, please refer to the paragraphs directly beneath the nutritional table on this page. For a detailed explanation of the Abbreviations used in the table below, please visit the Nutrition Tables abbreviations page. FSANZ alerts you to the inherent limitations of these data. Food composition data are average values obtained from a particular sample of foods, determined at a particular time. The nutrient composition of foods can vary substantially over different batches, and between brands because of a number of factors including changes in season, processing practices and ingredient source (including country of origin). Data generated for Australian foods may not be appropriate for use in other countries. To get the most accurate nutritional information possible about packaged manufactured goods, we recommend you read the nutritional panel printed on the food label. This set of food tables contains the kilojoules and calories per 100g of over 4500 foods plus the amount of Total Fats & Saturated Fats for those interested in tracking these additional nutrients. Our Summer Diet Plan for 2016 incorporates brand new recipes with lighter options for the warmer weather that the whole family can enjoy. The package contains a 4 week diet plan, 100 plus full recipes, an exercise plan, and a printed Summer Salads recipe book. This is a great four week diet plan for winter because it contains a range of winter warmer dishes, hearty soups, etc. This diet plan has 2-3 dinner choices per day, to offer flexibility and cater for different tastes. This PDF includes over 100 delicious recipes which you can print or save to your tablet or computer. 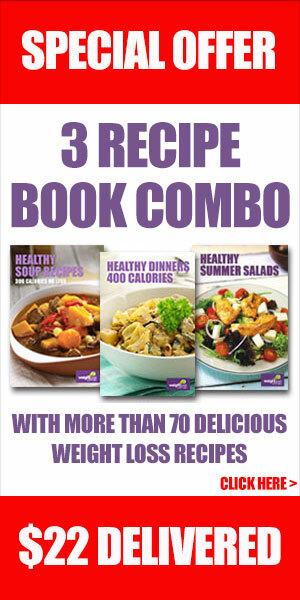 This is great for summer because it includes plenty of salads & lighter meals that won't keep you tied to the kitchen. This is a 2 week quick kick start diet plan. This PDF includes over 50 delicious recipes which you can print or save to your tablet or computer. This plan incorporates recipes with everyday ingredients. Pies, Soups, Pastas and even some desserts. We give you a choice of breakfasts & dinners each day. This PDF includes recipe links only. © Copyright 2005-2016 Ultimate Weightloss Pty Ltd. All rights reserved.